This, just this! It’s girls’ dream. 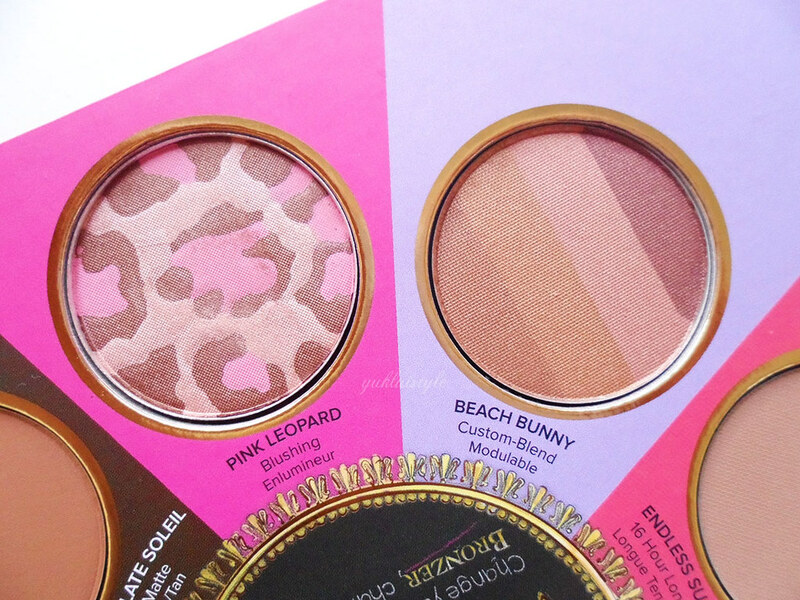 I remember having Sun Bunny and Pink Leopard as part of a limited edition palette back in 2010 but had lost it a year later. It was probably the perfect duo for me. I had completely forgotten about the two until this Little Black Book came into play early last year as a part of their summer collection. 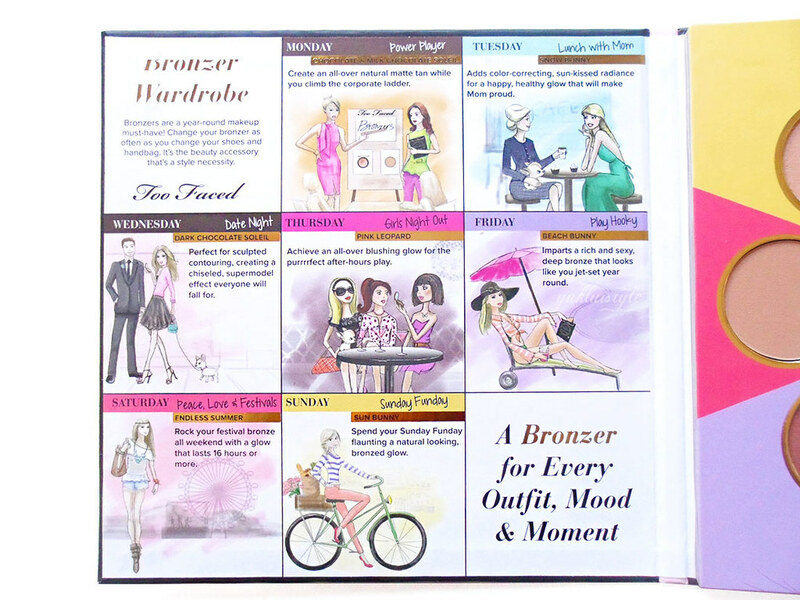 The cute book contains 8 of their iconic bronzers where one of them is the latest addition to their collection but all in miniature form. They did release a full sized pan version book and boy was that big and expensive. Every time I open this, I get the sweet smell of chocolate. Who doesn’t love that? 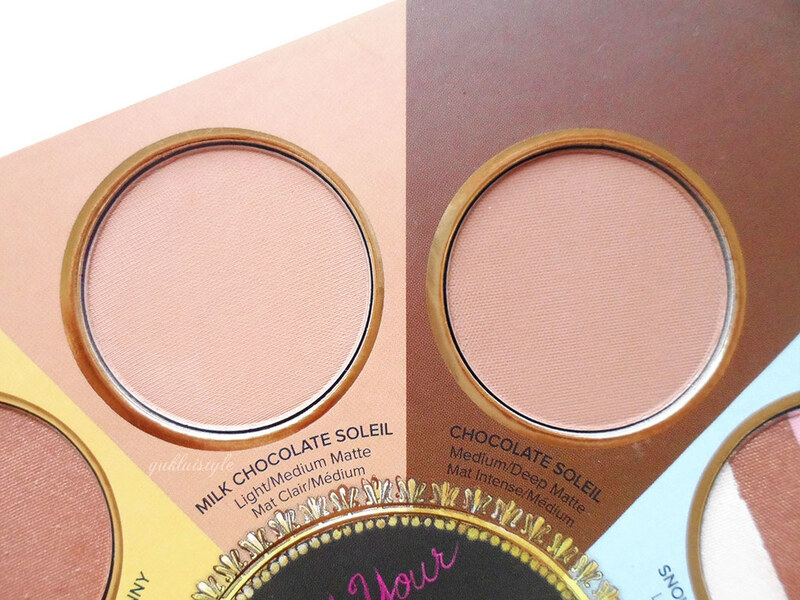 Chocolate Soleil: Antioxidant-rich, cocoa powder-infused matte bronzer that works on all skin tones, perfect for everyday contouring and creating an all-over deep tan. Milk Chocolate Soleil: A lighter version of Chocolate Soleil that creates a more subtle, all-over warmth, perfect for those with lighter skin tones. Dark Chocolate Soleil: A darker version of Chocolate Soleil that’s perfect for more sculpted contouring, creating a more dramatic, deep matte bronzed look. Snow Bunny: Four luminous shades blend together for just the right amount of sun-kissed, natural radiance. Pink Leopard: Trio of skin-brightening and bronzing pigments that combine for a glorious all-over glow. Beach Bunny: Custom-blend bronzer combines four sun kissed shades for a skin perfecting, summertime tan any time of year. Endless Summer: Stay all day universal bronzer creates a lit-from-within bronzed glow that lasts 16-hours or more. 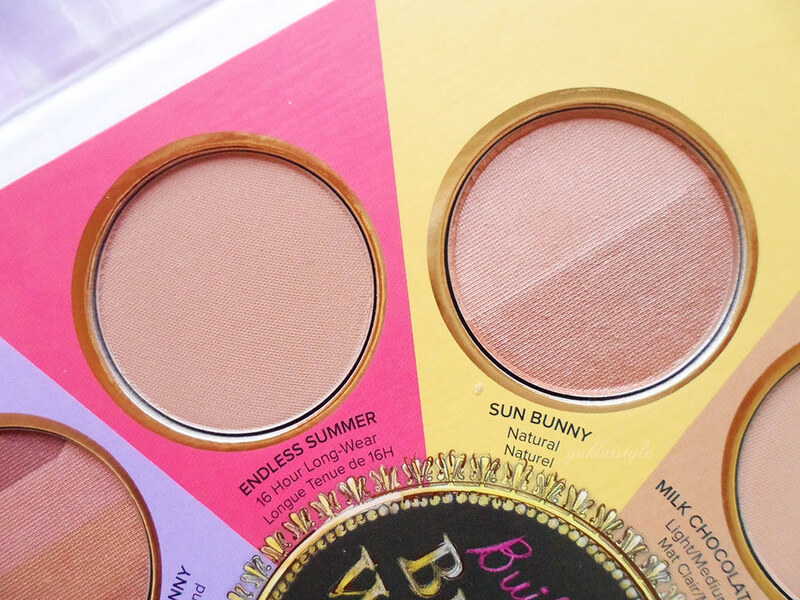 Sun Bunny: Original bronzer features slight pink undertone in the dual shade palette that mimics the flush of a real tan. 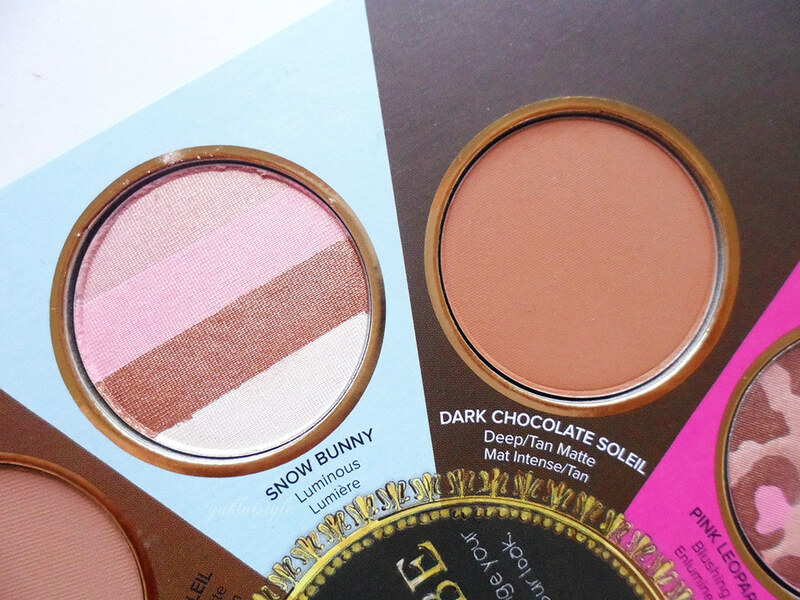 There is a mixture of matte and shimmery bronzers to suit your style. The shimmer doesn’t have glitter particles and you won’t end up looking like a disco ball. Back in the days, I used to use Sun Bunny to contour the cheeks (well, what I thought contouring was) then add Pink Leopard as a pinky glow on the apples. Too Faced has reformulated Pink Leopard a few months after this was released and it’s a completely different colour now. This palette has the old formula which I prefer! The old formula has more pink whilst the new has a lot less pink and is more of a shimmery bronzer. 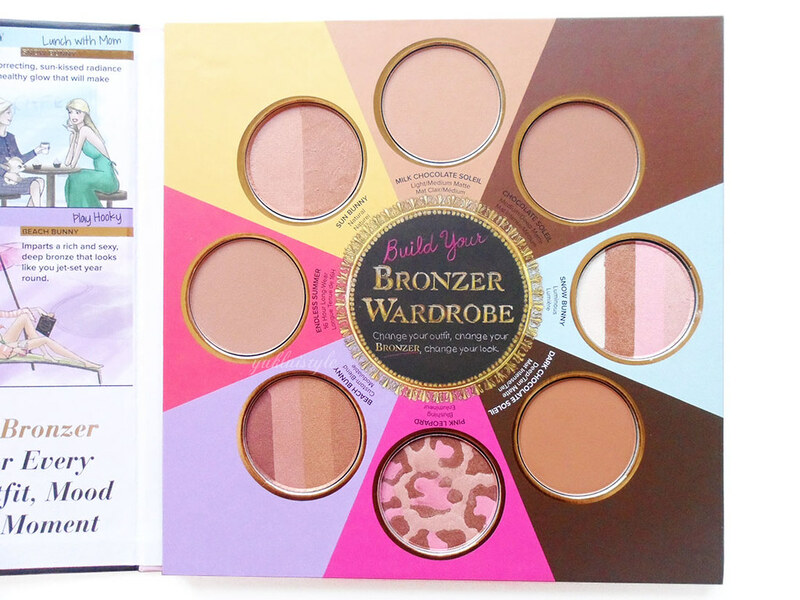 I’ve not tried their other bronzers so this was a great taster. I’ve used this to contour, to emphasise my tan, to add some colour and to glow. It makes creating a custom blend a lot easier now and it will suit all skin tones. The pans that has multiple shades, I can wear them individually, to highlight or as an eyeshadow. I can’t see myself hitting pan on any of these any time soon as I seem to switch it up every day and have been using it most days since I’ve purchased it last year. People may say the packaging is a waste but it’s Too Faced, they’re known for their packaging. Just look at the illustrations, they’re beautiful. Again, this was limited edition last year and is not easily available but, I’m sure you can find it online if you search for it! 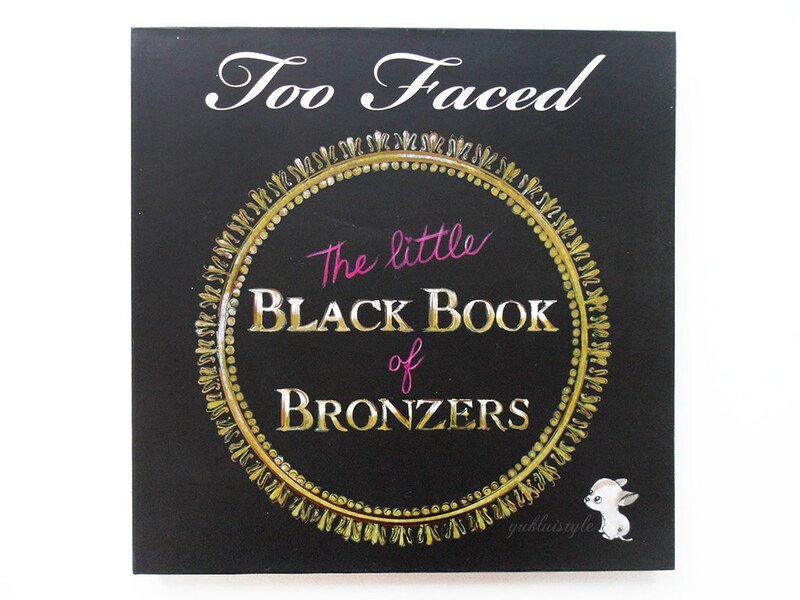 Have you tried any of Too Faced’s bronzers? This is such a gorgeous palette. Not sure i could justify the price tag tho! Oh this packaging is SO pretty! I definitely do need to invent in a bronzer. £40 is a biiiiit over budget for me though! I'm a big fan of Too Faced! I haven't tried these yet though. I have the chocolate soliel bronze and I love it! Wish a few colours matched my skin tone and I would've bought the palette in a heartbeat! LOVE how this palette looks! It's a brand I haven't used for such a long time, but I love the colours in this palette. Too Faced products always look like so much fun. Love this! Love the packaging – it would make a great Christmas present. I'm a sucker for nice packaging. I think it adds to the 'treat' feel that makeup should be. What *awesome* packaging! The product sounds fab too, of course, but I'm going googly eyed for the design! I love the selection! It would take me through every day of the year! I love this, what a cracking stocking filler! I really need to invest! What a great looking palette I love the range of colours and the packaging.